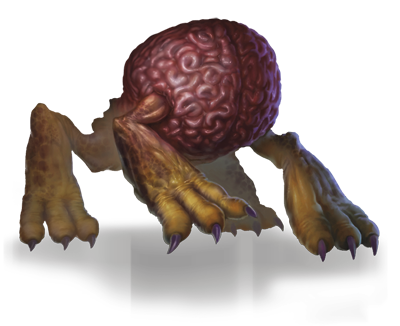 An intellect devourer resembles a walking brain protected by a crusty covering and set on bestial clawed legs. This foul aberration feeds on the intelligence of sentient creatures, taking over a victim’s body on behalf of its mind flayer masters. Mind Flayers breed intellect devourers to serve as roaming hunters of the Underdark, creating an intellect devourer by taking the brain of a thrall and subjecting it to a horrible ritual. As it sprouts legs, the brain becomes an intelligent predator as twisted and evil as its masters. An intellect devourer consumes a creature’s mind and memories, then turns the host body into a puppet under its control. An intellect devourer typically uses its puppet host to lure others into the domain of the mind flayers to be enthralled or consumed. 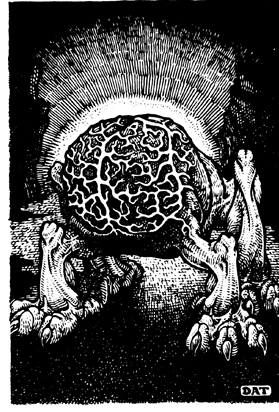 Aaron Hübrich helped orchestrate the illustrations for the Monster Manual’s intellect devourer, as art director at Conceptopolis. The intellect devourer is one of the most feared of monsters. They are found dwelling deep beneath the ground or in dark and dismal lairs in the wilderness. Although they are able to attack with their great claws, their primary offensive means is psionic, for they subsist on the psychic energy of their prey—whether gained from the dying shriek or by more subtle means. Of course, what better creature to associate with walking brains than mind flayers? It seemed inevitable that by 2nd Edition, the intellect devourer’s ecology became entwined with that of the illithid—who ate their larvae as a delicacy and kept the adults as watchdogs. It’s hard to keep a good brain down, however. While still largely under the creation and dominion of the illithid, intellect devourers reflect the potent abilities they’ve developed over the years—chiefly, consuming a victim’s mind and memories, and then turning the host body into a puppet under their control! The Monster Manual (releasing September 30) presents a horde of classic Dungeons & Dragons creatures, including dragons, giants, mind flayers, and beholders—a monstrous feast for Dungeon Masters ready to challenge their players and populate their adventures.